When it comes to deciding on which web hosting company to use it is important to understand that there is usually more difference between their services than just the prices that they are charging. While some deals might look cheap, when you look more closely they are often offering a very restricted service with limited bandwidth for only a dollar or two less per month than other companies will charge to provide unlimited services. While obvious differences like this may make it easy to eliminate the less attractive deals, it is when the services are very similar that making a choice can be more difficult. 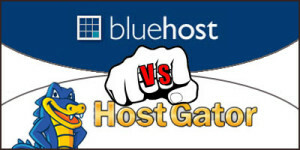 Two services that are offering almost the same levels of service across their product range are BlueHost and HostGator. Both are well established web host providers with a long history of reliable customer service and a high standard of technical reliability. In a BlueHost vs. HostGator match up they both offer services and pricing structures that are very similar with prices starting at $3.95 to $6.95 per month, which is very much at the lower end of the web hosting market. It is when you look at what you get for your $4 per month that the differences become apparent. At BlueHost there is only a single standard rate for their unlimited shared hosting accounts. The usual cost of $6.95 per month is all inclusive and, by using one of the readily available discount coupon codes you can reduce your costs for the first year to $3.95 per month. While that discounted rate from BlueHost is the standard price for the cheapest package from HostGator, their level of service for that price is limited to one domain. It also only includes shared online security features like SSL and IP address that you need for a high traffic commercial site and when these are added on the cost rises to over $10 per month. The management and administrative features provided by both of these web hosts is almost identical with both supplying cPanel and a template based website builder. They both provide the same ready to install list of scripts, e-mail autoresponders and anti-spam features. There are unlimited sub domains, MySQL databases and FTP accounts from both providers and they offer an equivalent level of bandwidth and transfer speeds. In the end the only thing that really divides these services is the level of service that you get for the cost of the account. Even if you use a coupon code to cut your set up costs for a year on BlueHost, after that honeymoon period your web hosting will return to their standard $6.95 per month. At HostGator, their $3.95 Hatchling plan will still cost less than $50 per year, and is even less for the first sign-up period with a Hostgator coupon code. If you want to use the internet for business then the basic BlueHost deal offers you the flexibility to expand and add domains that HostGator doesn’t. If you just want to have a hobby blog then the low monthly price of the package from HostGator, even with its limitations, will probably provide the level of service that you are looking for. Coupon Reporter – BlueHost Coupon Codes & Discount Promos is powered by WordPress | Entries (RSS) and Comments (RSS). | 25 queries. 0.502 seconds.